My interest in art evolved from near addiction to crayons and coloring books as a young child, through experiments with enamels, drawing, and oil and watercolor painting. Favorite childhood memories include creating shapes with clay I dug from a creek bed on my uncle’s farm in Pennsylvania. I continued with an unfocused enjoyment of art through various drawing and sculpting classes in high school, pottery classes contributing to an art minor in college, and an eclectic mix of art studies resulting in a master’s degree in art education. I taught elementary and junior high art for seven years, some of the most exhausting work of my life. Eventually my travels brought me to Washington, DC, where I landed work for the US Senate. I left art behind for many years as I focused on meeting the commitments and demands of Capitol Hill. It wasn’t until retirement that I found the Capitol Hill Arts Workshop and resumed my arts avocation. While at CHAW, I have been lucky to study watercolor painting and pastels under Gina Clapp and Ellen Cornett. I have also studied watercolor under Susan Abbott at the Alexandria Art League. In recent years, I have largely left watercolors behind and concentrated on pastels. I find watercolor unforgiving. 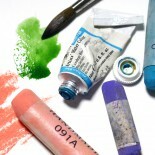 I particularly enjoy the freedom pastels offer for experimenting with different strokes and intensity of color and value. I generally have a notion of the end result of a piece. Eventually, though, it will differ from my expectations as I take advantage of the characteristics of the pastel to provide direction. I’m pleased when this gives my work freshness and creativity.